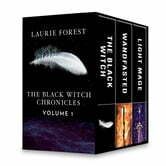 Journey to the magical world of Erthia in this exciting collection of stories from The Black Witch Chronicles by critically acclaimed author Laurie Forest. Though Elloren Gardner is the spitting image of her famous grandmother, the last prophesied Black Witch, she is utterly devoid of power in a society that prizes magical ability above all else. But as evil looms on the horizon and the pressure to live up to her heritage builds, Elloren’s best hope of survival may be among the most unlikely band of misfits…if only she can find the courage to trust those she’s been taught to hate and fear. Twenty years before The Black Witch, Erthia was rent asunder during the devastating Realm War. When Tessla Harrow is driven from her home by the fighting, she discovers a depth of power she never knew she had…and an irresistible draw toward Vale Gardner, the son of the Black Witch who is destined to save their people. Before Elloren Gardner came to possess the White Wand of myth, the Wand was drawn to another bearer: Sagellyn Gaffney, the first female Light Mage born in decades. When Sage discovers that the fastmate her parents chose for her is not the charming young man he appears to be, she is forced to abandon everything she once knew and forge a new path for herself…and find a way to protect the Wand from the dark forces hunting for it. Titles originally published in 2017 and 2018. Brilliant rich and delightful. I especially love the two stories after the main one going back and filling in and expanding your knowledge of the world and how the first story evolved. Each one special leaving you wanting to know more.